I had right hip Arthoscopic Surgery back on Dec 15th. They went in to repair a labrum tear. Making the decision to go through with surgery goes in the logbook as one of the hardest decisions I have had to make. After what they found in surgery and with where I am at in recovery I know it was the best decision. I am now three weeks in to recovery. Phase 2 of 4. Phase 2, is 2-6 weeks post surgery. 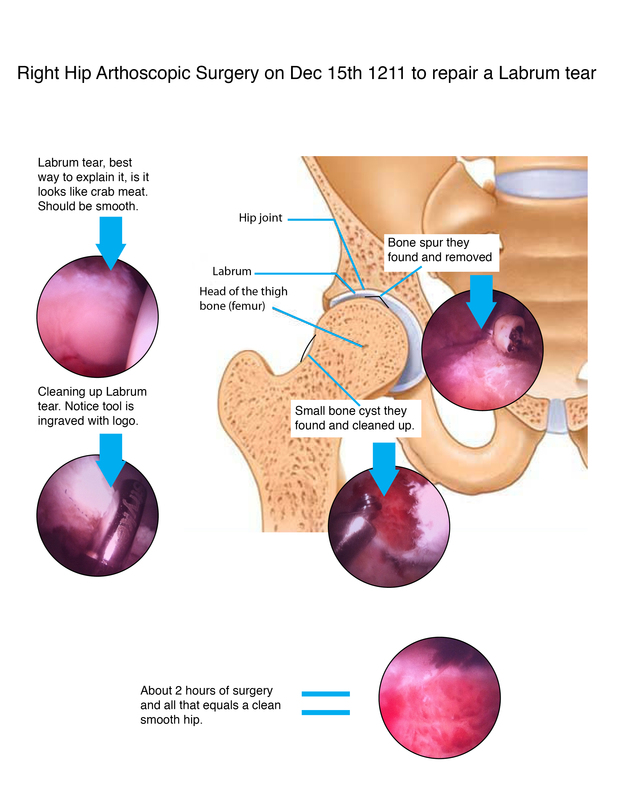 This is the healing of hip and muscles. Advanced weight bearing and discontinuation of Crutches! I go to PT at Mill Valley PT once a week, with workouts of stretching, at home, every day. The healing process is coming along, with less pain, and increased range of motion, as I continue to stretch and rest. When I feel good, I want to be on my feet, and riding my bike. I have so much energy bottled up, and few ways to let it out. I am still not allowed to really ride with resistance, and to much time on my feet makes my hip ache. So I am learning patience. I was laying on a table with a heating pad and muscle stimulators attached to my hip this morning at PT. I’m laying there thinking about patience. Its a good thing to have and an even better thing to practice. Ive been struggling with the latter. I was thinking about how it applies to a race. During a race you must be patient and not show all of your cards, take the time to test others, and act when you know the moment is right. I lay there as my muscles are zapped, and reflect on races, when I showed patience, when I did not, and how that worked out for me. This turned out to be a great mental exercise. As physical exercise is limited, I will have to practice mental exercises, and know that all great things take time and work. With that said, looking forward to the 2012 race season with Vanderkitten-Focus.